Each of our necklaces is handmade to order. The Hourglass necklace is made from layers of laser cut acrylic using opaque black and clear transparent. 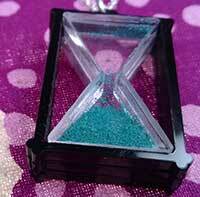 In between the middle of the necklace there is a layer of sand that moves like a real hourglass. Size info: 25mm wide 33mm high with a depth of 9mm.Chain info: 20" silver plated chain and has a bolt ring fastening.